www.pdfstall.online: Refrigeration Equipment: by "A. C. Bryant"
Refrigeration Equipment: by "A. C. Bryant"
This handbook has been written to meet the need for a practical guide to refrigeration systems and their installation, maintenance and repair. It deals with all the basic installation and service procedures and aims to be useful equally to the practising mechanic and to the trainee or student technician. 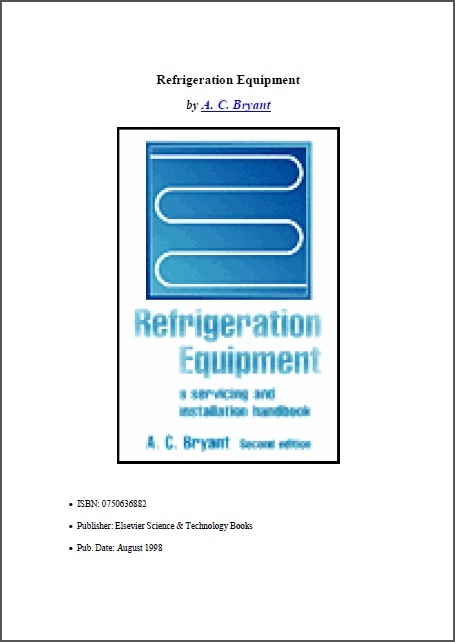 The first edition of Refrigeration Equipment became the standard text for the City & Guilds 2070 course. The new edition will provide underpinning knowledge for the new Level 2 NVQ, and the fundamental for students following Level 3 NVQs, within the City & Guilds 6007 scheme. It also continues to cover for the BTEC National unit in refrigeration technology. Many refrigeration mechanics receive their training within the industry, either 'on site', or in a manufacturer's in-plant training course. These trainees will find this book a helpful source of information and reference. Finally, refrigeration installations are to be found in numerous establishments-in the frozen food industry, airports, hotels, hospitals, supermarkets-where maintenance personnel may sometimes be responsible for maintaining an emergency service until specialists are available.